Flowering habit at Kula Botanical Garden, Maui, Hawaii (USA). March 07, 2011. Origin and Habitat: Colombia and Ecuador. Ecology Guzmania wittmackii is a day-flowering, close relative of Guzmannia alcantareoides, produces a brilliantly coloured inflorescence to catch the attention of birds who are the main pollinator of this species. Description: Guzmania wittmackii is an evergreen herbaceous epiphytic bromeliad. It is a relatively large Guzmania, with a tall flower spike and prominent lilac purple bracts. The bracts remain in colour for months. It is distinct from most other species of the genus Guzmania in having definitely carinate floral bracts. Rosette: Funnel-shaped with the leaves placed in way to form a rosette with central cavity usually full of water. Leaves: Unarmed, glossy dark green leaves, up to 60-80 cm long and 2-3 cm broad. Inflorescence: The short floral scape, at the centre of the rosette, is covered by bracts resembling to the leaves, and ends with an about 80 cm long inflorescence, formed by oblong, carinate, floral bracts, prominent and wrapping the base, of decreasing length towards the apex, usually magenta coloured which remain unchanged for about four months. The flowers, inside the bracts, are white with about 9 cm long petals. Blooming season: Usually in cultivation it flowers fromlate winter to spring. It is a monocarpic plant (bearing flower/fruit only one time during its existence) and a rosette usually reaches the flowering size in three to four years and then fade over a period of one years. Remarks:Across its range it is quite variable and it has been used for breeding as the primary parent for many of the variously coloured guzmanias widely used in interior scapes and tropical shade gardens. Cultivars produce blooms in a variety of differently coloured bracts, such as yellow, orange, red, mauve, and lavender. 1) Forest & Kim Starr Guzmania wittmackii (Guzmanea). Plants of Hawaii. <http://www.starrenvironmental.com>. Downloaded on 16 Sep. 2014. 2) Wikipedia contributors. "Guzmania wittmackii." Wikipedia, The Free Encyclopedia. Wikipedia, The Free Encyclopedia, 21 Aug. 2014. Web. 17 Sep. 2014. 4) Gilmartin, A. J. 1972. "The Bromeliaceae of Ecuador." Phanerog. Monogr. 4: 1–255. 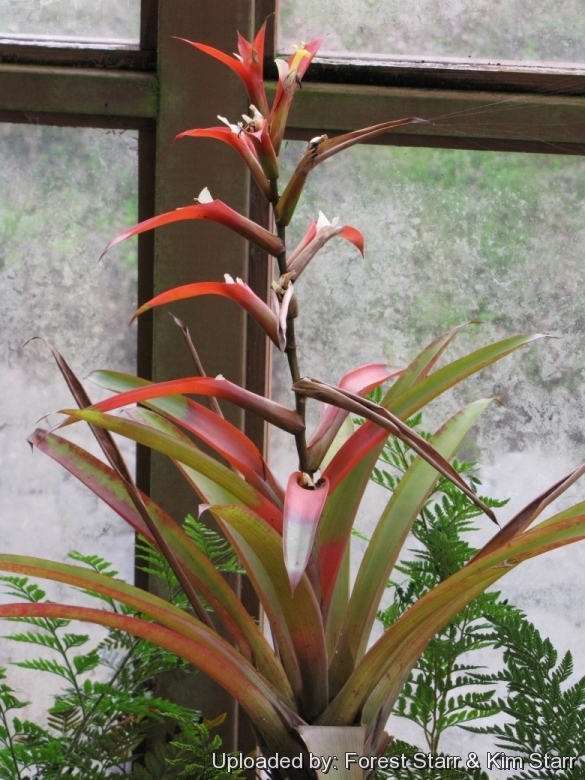 Cultivation and Propagation: Guzmania wittmackii is a bromelid of remarkable ornamental value, both for the foliage and for the particular shape and colour of the inflorescence. As it is native to rainforests, cool evening temperatures with warm days and high humidity describes its best growing conditions, however it grows very well as a home plant too. Individual plants live three to four years. Watering: It enjoys constant moisture from rain or sprinkler. In dry and hot climate, humidity can be increased with nebulisations utilizing water at room temperature and not calcareous. In summer, some distilled water can be left in the central cavity formed by the rosette of leaves, renewing it frequently to avoid the formation of a mosquito larvae nest, whilst in winter it is better to leave it dry, thus avoiding possible rottenness. In presence of dry air and high temperatures, humidity can be incremented with nebulisations, utilizing water at room temperature and not calcareous, in order not to cause anti-aestethic dots on the leaves. Requires complete and perfect drainage. If you have one that is not flowering then keep very warm in the spring and water sparingly. To remove excess salt build-up, leach bromeliad pot once during the summer. Hardiness: It must be grown in a frost-free situation in open air in the tropical and humid subtropical climate countries, with temperatures which it is good to keep over the 14°C, best 20-24°C. Its foliage gets damaged already with temperatures just over the 0°C. Propagation: When the flower spike fades, pups appear from axillary gemmae between the leaves near the base of the plants. The offsets can be detached and repotted when they have reached the dimension of one third of the mother plant. Be sure to provide high humidity for a month after propagating the offsets. It may also be grown from seed: remove seeds from inﬂorescence and lay them uncovered on a bed of crushed tree fern fibres; keep constantly but moderately moist. Starting from the seed, 5-6 years are needed for the blossoming, whilst at least 3 years are needed by division. The wide scale reproduction for commercial purposes is done by micro-propagation.